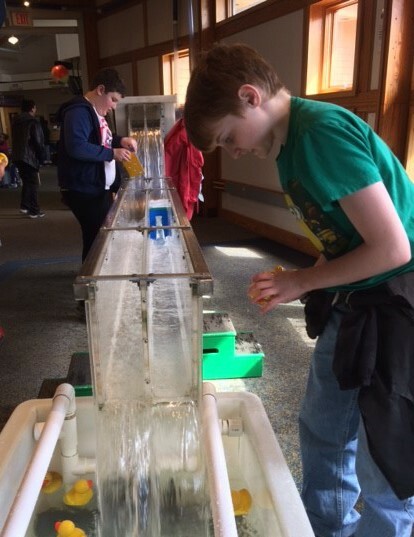 JFS sixth-grade students recently visited the Ithaca Science Center where they spent the day engaged in a variety of hands-on activities and demonstrations. Students learned about the power of air and launched paper rockets, and wound their way through a maze to learn more about aeronautics. While in the Saltonstall Animal Room, students learned about the features and unique habitats from around the world of different amphibians, reptiles and fish and had the opportunity to pet some of the reptiles, including a Southeastern Corn Snake! Another fun experience was the tropical rainforest with some mysterious green tree pythons. Students also discovered a red lionfish suspended within a North Carolina shipwreck. Next, the students enjoyed the Sun, Earth, and Universe exhibit exploring various topics about space. Students built and tested a spacecraft, used tools like infrared light to detect the invisible, and used color blocks to map out the elevation of Mars. They also explored three natural resources—water, wind, and the sun—and how they can be used to generate electricity. The trip to the Ithaca Science Center really reinforced the idea that science is FUNdaMENTAL!